Tired of boring lunches? I know I was…but that all changed when I started making this easy healthy lunch recipe. 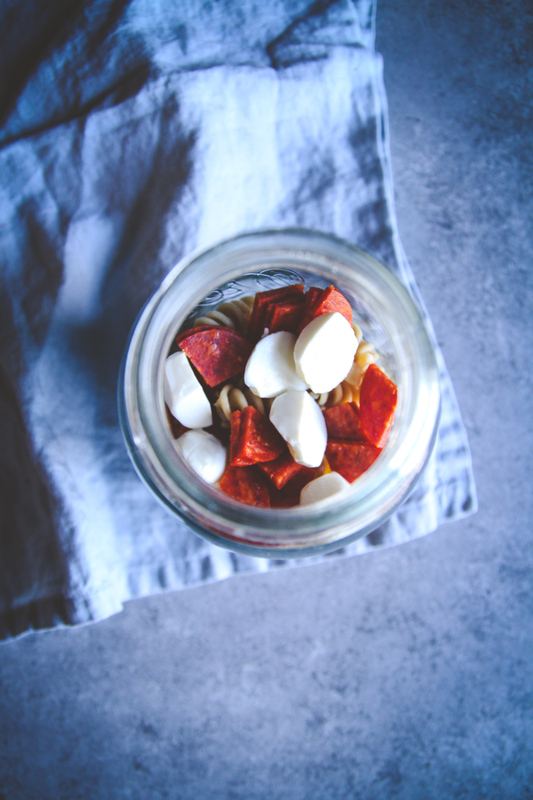 It’s a pepperoni pasta salad in a jar. It’s SO good, you’ll be saying goodbye to boring lunches and making this over and over. HI! I know it’s been a minute since I last posted. 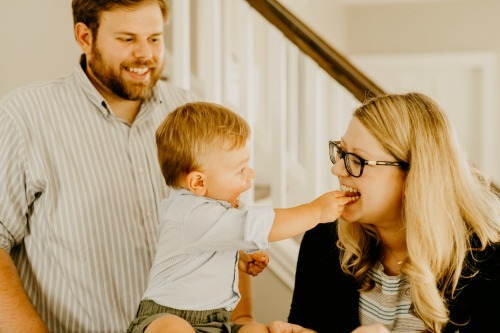 My son got sick, then got me sick, then I was super sick and my cold turned into a sinus infection. 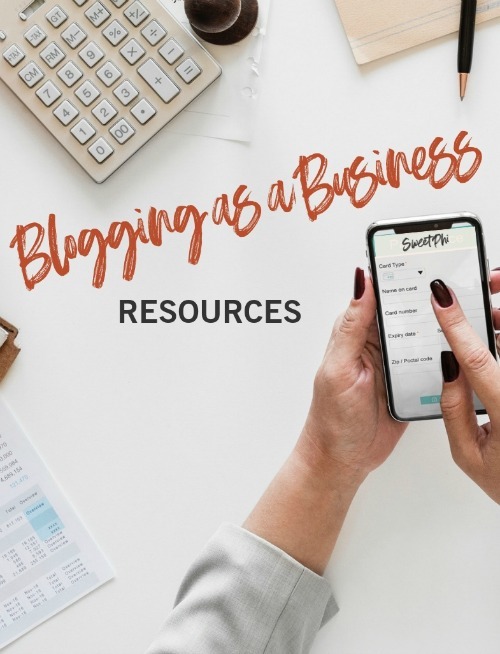 I had written this post before getting sick, so today I just am hitting the publish button because I added the ingredients to my shopping list for Sunday – I’m still only at 80% hoping by Sunday to be at 100%, but it’s been too long and I miss you guys – how are you!? It’s probably a little dorky that I feel proud and a little cool that I made a salad in a mason jar? Right? That’s ok though…because at this point, I’ll do whatever it takes to actually eat a salad. I don’t know what it is, but it’s like there was a hurdle I need to get over in order to actually enjoy a salad at lunch, one that I made at home, instead of one that could be purchased. This pepperoni pasta salad has been my saving grace. I now actually look forward to lunches, because I know I’ll be be having this! What I love is that it’s such an easy healthy lunch recipe, and you can make it with so many variations. 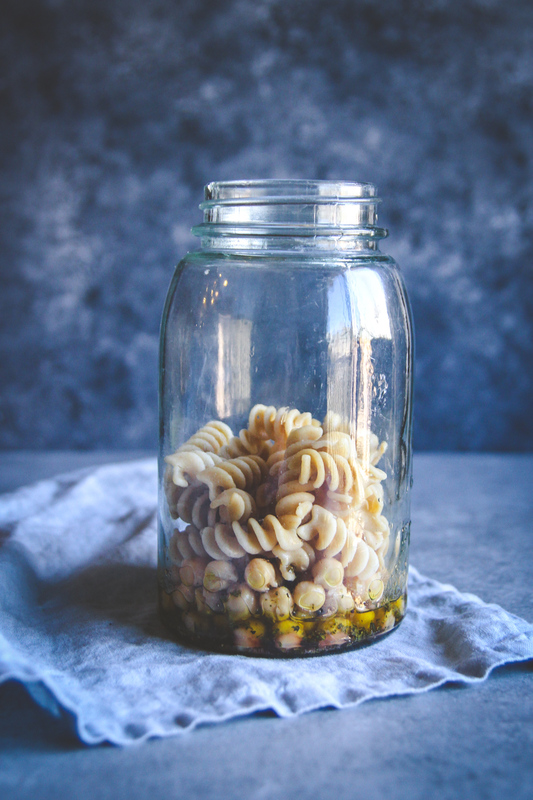 And don’t worry, if you don’t have a jar, please make this pasta salad anyway, just make it in a container. My husband requests it like this (in a ‘normal container’ he calls it, because he doesn’t want to bring a jar in to work and then have to pour it out into a bowl, fair enough). Next add the chickpeas and pasta, put the lid on your container, and gently swirl it so that the beans and pasta are gently coated in the dressing. This will make it super flavorful! Take it to work, shake it up, enjoy! You could sub out the greens-I’ve made this with a mix of arugula and spinach, just spinach, just arugula, Spring greens, butter lettuce, no greens when I didn’t have any on hand. Basically, use what you have in terms of greens…or don’t use any, your choice! I used whole wheat pasta. You could easily use any type of pasta you have (gluten free, regular pasta, whatever you’ve got). You can also use whatever shape you like. I like the rotini shape because it sops up the dressing in the little spirals, but I’ve also made this with different types of pasta and it comes out great! 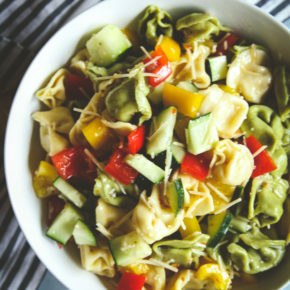 There you have it, a super easy healthy lunch recipe: pepperoni pasta salad. I’ve made this so many times since creating the recipe, and it has become one of my all time favorite lunch recipes. Plus, I love how easy it is to prep the night before. It takes all of two minutes, if you’ve cooked your pasta ahead of time. 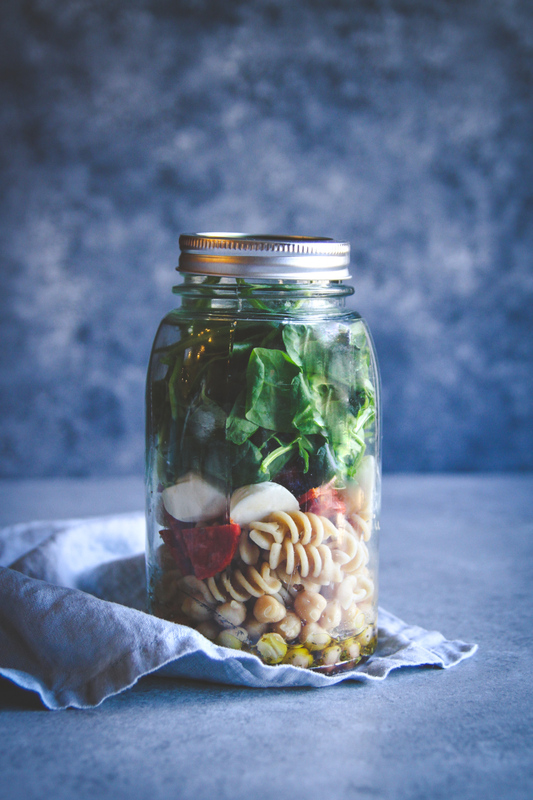 Next time you’re looking for a healthy lunch recipe, I would definitely recommend this one, because it’s pasta, it’s a pasta salad in a jar, and it’s delicious! 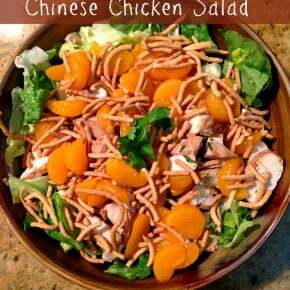 Do you like pasta salads/salads for lunch? 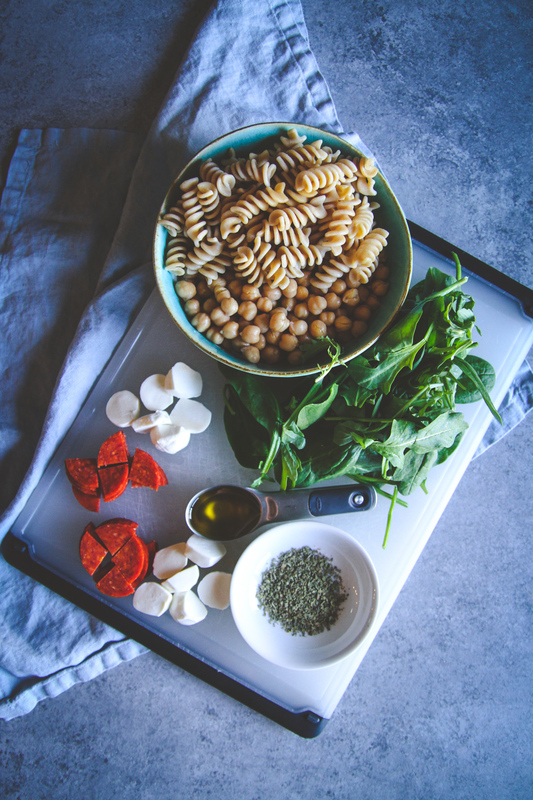 Leave a comment below telling me your favorite type of pasta salad toppings. Start by cooking your pasta according to package instructions. This can be made a day ahead of time. 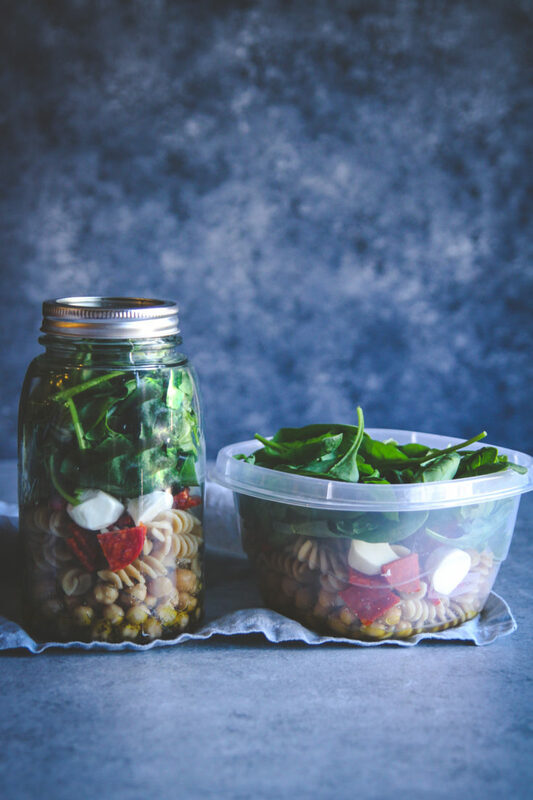 Into a large jar or food storage container add olive oil, red wine vinegar, oregano, pinch of salt and pepper, swirl it around so that the dressing mixes. Add in the chickpeas and pasta and stir. Next add in mozzarella and pepperoni and greens. Store in container overnight and enjoy the next day for lunch. 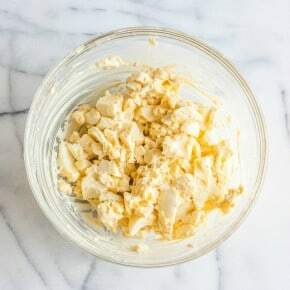 Can be kept in the fridge for 4-5 days. Holy cow does this sound yummy! I foresee making a bunch of these for quick lunches while trying to keep up with my kiddo!